Several generations have now grown up with the Israeli-Palestinian conflict. Central to that reality has been the start and stop of Arab-Israeli peace talks, which always seem to take one step forward and then three back. But in some areas of the world, most recently on Capitol Hill in Washington, D.C., talks between Arabs and Israelis are continually moving forward with the same message: peace. Yesterday I attended a discussion hosted by Americans for Peace Now (APN), which featured Ori Nir of APN and Hussein Ibish of the American Task Force on Palestine. While their speeches, comments, and answers to questions were certainly insightful, the most striking lesson that I left the brown bag lunch with was the plain and simple fact that an Arab and an Israeli could talk with one another and agree upon the most basic desire for anyone involved in the Middle East: peace in Israel/Palestine. Now, at first that sounds rather silly to come out of such a discussion focusing on this basic and fairly self-evident thought. However, from my short time working on the Israeli/Palestinian conflict, and especially how it is approached in the United States, I have found that many people deeply involved in the issue have lost sight of that basic fact. We all want the same thing. Jewish Israelis, Arabs, American Jews and Arab-Israelis all deeply desire peace. The main problem of the specific terms of peace still appears insurmountable at times, but the end goal is a common one. At the talk, which was open by invitation to interns on Capitol Hill in hopes of inspiring the younger generation to work towards a comprehensive peace, of course the standard topics of two-state versus one-state solution, Hamas, the future of Fatah, Palestinian state-building efforts, the effect of the American government, etc. were all touched upon. Listening to the complexity of the issue unravel before you, the probability of a successful two-state solution not only seems far off but shrouded in complicating factors and misleading stereotypes held by all sides. But unlike most talks on this issue that I have attended, I came away from this one optimistic and uplifted by the image of an Israeli and an Arab both speaking passionately about the need for peace – the need not only just for the Palestinians and Israelis, but for all Americans, all Arabs, and the world to realize this peace. Peace can and must come to pass in this conflict, which has continued throughout not just my lifetime but my parents’ lifetimes as well. Such a peace can only succeed if all parties stop focusing on what the other side is doing wrong and instead recognize that they are not the only party with dear interests at stake. I am entirely aware that my statements now are highly idealistic and that peace is complicated by many factors, not least of which is the imbalance of power between Israel and the Palestinians. But without reminding ourselves to think of all the interests involved in the issue and the common-held desire to see peace within our lifetimes, I believe that a true, successful peace will be lost. Budrus is a small, relatively unknown Palestinian village located near Ramallah with a population of about 1,500. The documentary tells the story of the community’s struggle with the state of Israel in 2003 against plans to build part of the separation barrier through the village. The proposed plan would have surrounded the village and confiscated 40% of the land. The documentary follows a local leader, Ayed Morrar, who united the community to try and block the plans through nonviolent means. He brought together an unlikely group, comprising of members of Hamas and Fatah as well as Palestinians, Israelis, men, and women. Perhaps most crucial was the role of women. Morrar was unable to mobilize the community until his 15-year-old daughter Iltezam brought women to the movement. The women would stand in front of bulldozers or lie in front of olive trees, and IDF soldiers did not know how to deal with them. The documentary actually shows some soldiers beating women. As a result, a woman IDF soldier was called in to handle them. 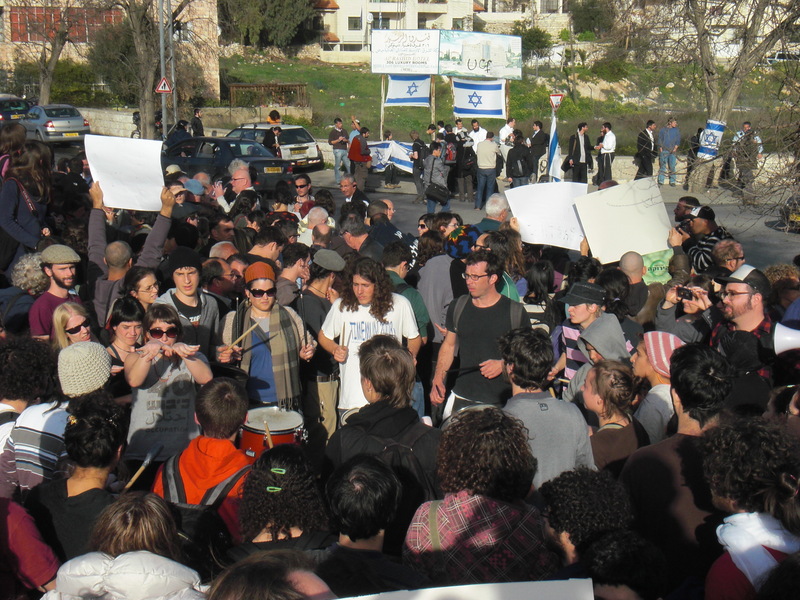 Israelis played a crucial role in the nonviolent movement as well. Iltezam states how she did not think she would ever have an Israeli friend before; she never knew any, only IDF soldiers. Morrar, who was at the event yesterday, commented on how through this event, he was able to see the good side of Israelis. He was able to see and meet Israeli that want peace and who want to raise their children in peace based on justice, not peace based on what Morrar calls the relationship between the slave and master. Israelis are very important in the nonviolent movement, as they give credence to the Palestinian struggle by questioning the actions of their own state. Also unlikely was the cooperation of Fatah and Hamas members. Morrar recounted how politics were temporarily put aside, as both parties, even if they differed ideologically, desired the same results. Politics is indeed an important issue in the struggle for nonviolent protest. The pockets of resistance in villages such as Budrus do not have any national leadership yet, and the role of the PA in the nonviolent movement is still questionable. Though the movie documents the struggle of just one village, its message offers hope for what is possible: eventual freedom. The producers of the film, Just Vision, are trying to spread this message. Just Vision is currently on a six month promotion tour through the U.S. For Screenings of “Budrus” in your area, click here. In the end, the villagers of Budrus, after 10 months of nonviolent protest, forced the IDF to move the separation barrier out of the village. They saved 95% of the land, and the barrier was built almost entirely on the Green Line. Some parts even went into the No Man’s Land area. However Israel will not acknowledge the efforts of the Budrus villagers. The official response from the government is that the barrier was not moved because of the villagers’ efforts, but for other reasons. Helen Thomas’ misinterpreted remarks about Jews in Palestine led to the end of her accomplished career. Meanwhile, Senator Schumer of New York is allowed to say he supports the continued “economic strangulation” of Gaza, without anyone even blinking twice. Schumer is a powerful politician; he is the vice-chairman of the Senate Democratic Caucus, and the third highest ranking Democrat in the Senate. His position in the government makes the fact that he can make such comments without press coverage or any sort of accountability is especially perturbing. A mix of Palestinians, West Bank settlers, environmentalists and developers, have all united in opposition to the construction of the separation barrier in an area around Jerusalem (Haaretz). Ever since, the family has been devoted to seeking a proper investigation and justice. With guidance from the U.S. government and support of over 70 congressmen, the current court claim against the State of Israel and the Israeli Defense Ministry is currently playing out. The Corries are represented by Hussein Abu Hussein, an experienced human rights activist in Israel. According to The National, Mr. Corrie said, “The verdict is the ability to get some sort of accountability [and] responsibility. It’s the only way to do it.” One challenge in the courtroom on Wednesday was the quality of translation to Hebrew, which was of concern for the Corries. Whatever the outcome of the case, the Corries are succeeding in their goal to raise awareness. By using the case as a platform, the Corries hope to bring to light abuses by the Israelis in the Palestinian Territories and a lack of legal fairness and Israeli accountability. Just last week CNN called Sheikh Jarrah “Jerusalem’s ground zero”. On Friday I joined 300 Israelis, Palestinians, and internationals to protest the ongoing evictions of Palestinian families from their homes in Sheikh Jarrah, and the takeover of this East Jerusalem neighborhood by Jewish settlers. Sheikh Jarrah, which lies just outside the Old City, has attracted global outrage as settler organizations have made legal claims to the property allegedly owned by Jewish individuals or associations prior to 1948. As noted by UN-OCHA in their damning fact sheet on the Sheikh Jarrah evictions, “Israeli courts have ruled in favor of such claims while failing to recognize the rights of Palestinian refugees to reclaim lost land and property.” UN-OCHA estimates that the implementation of the Israeli government’s comprehensive settlement plans for Sheikh Jarrah will place “475 Palestinians at risk of forced eviction, dispossession, and displacement”. Like all settlements in occupied territory, the Sheikh Jarrah settlement is a violation of international law. The stand-off during Friday’s demonstration was electric in its intensity. 300 protesters were on one side of the street and on the other side, a dozen settlers and several dozen police and medical personnel fanned out across the entrance to the homes under eviction orders. The Jerusalem magistrate court had dealt a blow to the police the day before, ruling that public demonstrations in Sheikh Jarrah were legal so long as they didn’t disturb the public order or disrupt traffic. Despite a vow from the police to squash protests despite the court order, this time no one was arrested. The whole scene created an arresting visual effect peopled by the three clear categories of uniformly dressed settlers, police, and medical personnel on one side of the street, while the hundreds of protesters on the other side drew a stunningly diverse crowd. Kippa-wearing men mingled among Palestinian Sheikh Jarrah residents while a young activists’ drumming circle led Hebrew University professors to join in protest chants. Meretz MK Ilan Gilon showed up, while last week MK Mohammed Barakeh and former Knesset members Avraham Burg, Uri Avnery, and Yossi Sarid attended. Bernard Avishai reported on his blog that Oslo negotiator and head of the Peres Center Dr. Ron Pundak joined the protest along with the highly acclaimed Israeli author David Grossman. He described what happened on August 2, 2009 when he was evicted along with 52 other refugees – 20 of them children – from Sheikh Jarrah following a court ruling. These families had been forced out of their homes in 1948 and given homes in Sheikh Jarrah by the UN and Jordan. I asked one Israeli protester, Eva Ferrero, why she came to the protests. “It makes it known what they are trying to do in silence,” Ferrero responded. Ferrero comes regularly to the Sheikh Jarrah protests and visits the families who were evicted. If you only get your news from the most established media networks of the “free world”, you may well have missed it. About 1,000 Israelis demonstrated in Tel Aviv on Saturday night against the blockade on Gaza on the one-year anniversary of Operation Cast Lead. What was even more gutsy is that the protesters demanded an investigation of war crimes committed, that all war criminals be brought to justice, and the occupation be ended in its entirety. translation: "IDF: The Most Moral Terrorist Organization in the World"
My Israeli friend Slava and I arrived late, so we missed the gathering at Yitzhak Rabin Square. “We’ll find them,” he said looking up at the sky. “We’ll just follow that police helicopter and where its pointing the light.” I looked up to see a helicopter hovering above diagonally streaming down a shaft of light. 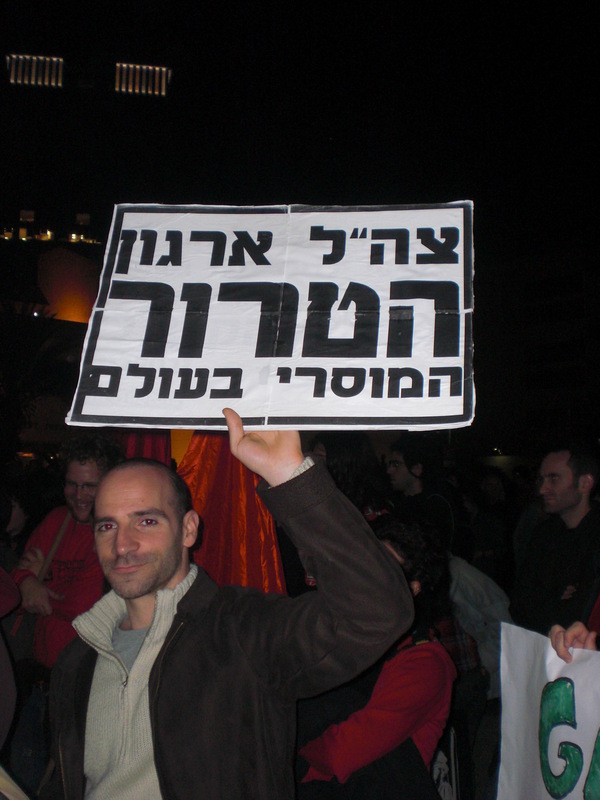 He was right–following the nearest hovering helicopter turns out to be an excellent way to find a protest in Israel. Since the question must be asked around this part of the world–no, most of the participants were not ‘Arabs’, that is, ethnic Palestinians who are citizens of Israel. The great majority were Jewish Israelis marching with a substantial Arab minority. Jews and Arabs marched together and the presentations were in both Hebrew and Arabic. From David Shulman, via Phil Weiss, comes this great account of the Israeli security forces laying into a crowd of more than a hundred, apparently Jewish, Israelis who held a peaceful demonstration at one of the Palestinian houses in the Sheikh Jarrah, East Jerusalem, that has recently been taken over by settlers. Somehow it begins. Someone gave the order. I don’t know who. Later someone says it may have been connected to the flags. It’s possible—I didn’t see it—that one of our demonstrators reached the window of the stolen house and tore down the plastic Israeli flag. Maybe that triggered it. But I think they were anyway just itching to tear into this crowd. So when the moment comes, it starts somewhere at the edge of the family’s tent set up in what’s left of their own front yard and then swirls rapidly in widening arcs and circles, a vortex drawing each of us in.